(Nanowerk News) The secret desire of urban daydreamers staring out their office windows at the sad brick walls of the building opposite them may soon be answered thanks to transparent light shutters developed by a group of researchers at Pusan National University in South Korea. A novel liquid crystal technology allows displays to flip between transparent and opaque states -- hypothetically letting you switch your view in less than a millisecond from urban decay to the Chesapeake Bay. Their work appears this week in the journal AIP Advances ("Fast-switching initially-transparent liquid crystal light shutter with crossed patterned electrodes"). A dye-doped PNLC cell in the transparent and opaque states, placed on a printed sheet of paper. In the transparent state, the clear background image can be seen because of the high transmittance of this cell. In the opaque state, black color is provided and the background image is completely blocked, because the incident light is simultaneously scattered and absorbed. The idea of transparent displays has been around for a few years, but actually creating them from conventional organic light-emitting diodes has proven difficult. 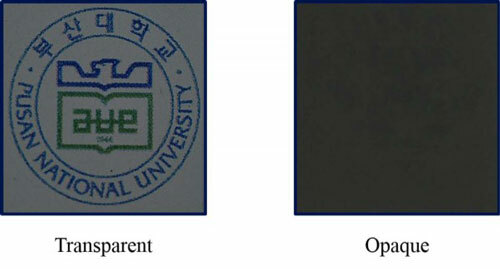 "The transparent part is continuously open to the background," said Tae-Hoon Yoon, the group's primary investigator. "As a result, they exhibit poor visibility." Light shutters, which use liquid crystals that can be switched between transparent and opaque states by scattering or absorbing the incident light, are one proposed solution to these obstacles, but they come with their own set of problems. While they do increase the visibility of the displays, light shutters based on scattering can't provide black color, and light shutters based on absorption can't completely block the background. They aren't particularly energy-efficient either, requiring a continuous flow of power in order to maintain their transparent 'window' state when not in use. As a final nail in the coffin, they suffer from a frustrating response time to power on and off. Tae-Hoon Yoon's group's new design remedies all of these problems by using scattering and absorption simultaneously. To do this, Yoon's group fabricated polymer-networked liquid crystals cells doped with dichroic dyes. In their design, the polymer network structure scatters incident, or oncoming light, which is then absorbed by the dichroic dyes. The light shutters use a parallel pattern of electrodes located above and below the vertically aligned liquid crystals. When an electric field is applied through the electrodes, the axes of the dye molecules are aligned with that of oncoming light, allowing them to absorb and scatter it. This effectively negates the light coming at the screen from its backside, rendering the display opaque - and the screen's images fully visible. "The incident light is absorbed, but we can still see through the background with reduced light intensity," Yoon said. In its resting state, this setup lets light pass through, so power need only be applied when you want to switch from transparent window view to opaque monitor view. And because the display's on-off switch is an electric field, it has a response time of less than one millisecond - far faster than that of contemporary light shutters, which rely on the slow relaxation of liquid crystals for their off-switch. Future work for Yoon's group includes respectively increasing and decreasing the device's transmittance at the transparent and opaque states, as well as developing a bi-stable light shutter which consumes power only when states are being switched, rather than maintained.